Mazda’s CX-9 has been recognized as one of the best SUV / Crossover / Minivan / Station Wagons in its class since it made its world debut back in 2006, and it reigns today as the senior member of Mazda’s versatile SUV lineup. Regardless of what category one chooses to place the Mazda CX-9 in; it is first and foremost a Mazda with the same “Zoom-Zoom” properties as the rest of the vehicles in the lineup. Mazda categorizes the CX-9 as a 7-passenger, 3-row crossover SUV. Mazda’s crossover category entries actually differ from the majority of their competitors — in that they display a level of styling that is not only distinctive, but purposeful as well. In terms of its functionality and versatility, it is not unlike many other crossover segment entries. The real difference comes from its roots or DNA — beneath the appealing exterior styling, lies what the Mazda team continues to refer to as the” soul of a sports car”. 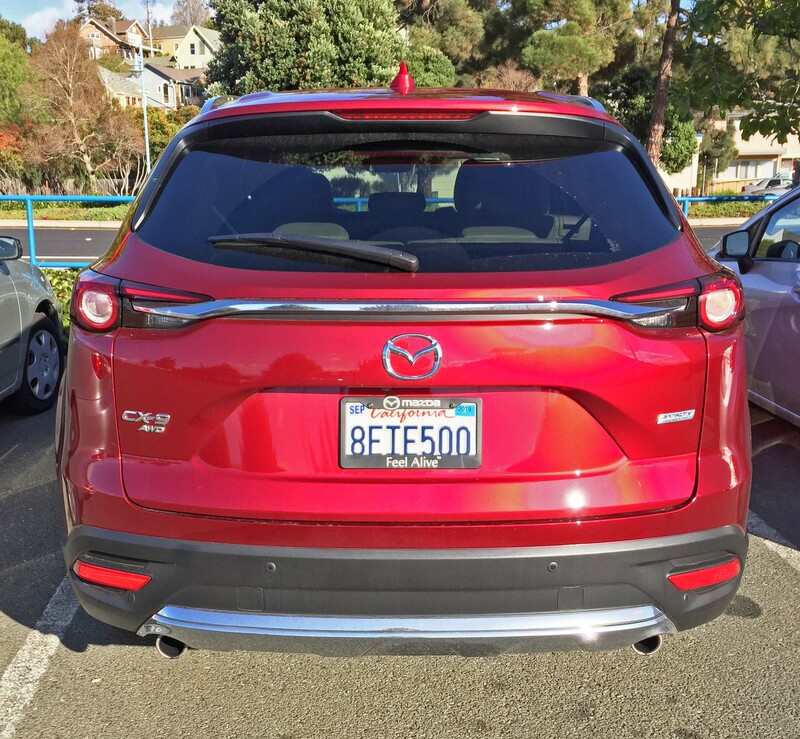 It is certainly appropriate to reference the CX-9 as a “Zoom-Zoom transport with More Room” inasmuch as it’s smaller stablemate, the CX-7 was tagged as featuring “Zoom-Zoom with Room”. 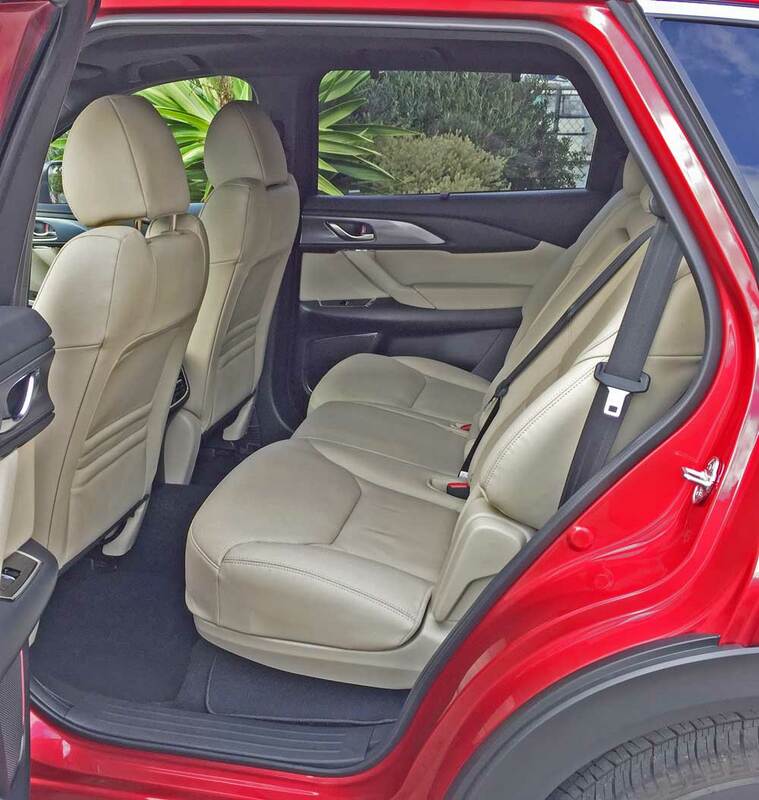 There’s also a CX-5 compact SUV. Allowing consumers tp make a choice in terms of size. The CX-9 was engineered for and focuses on combining a sporty driving spirit with the versatility and functionality of an SUV. 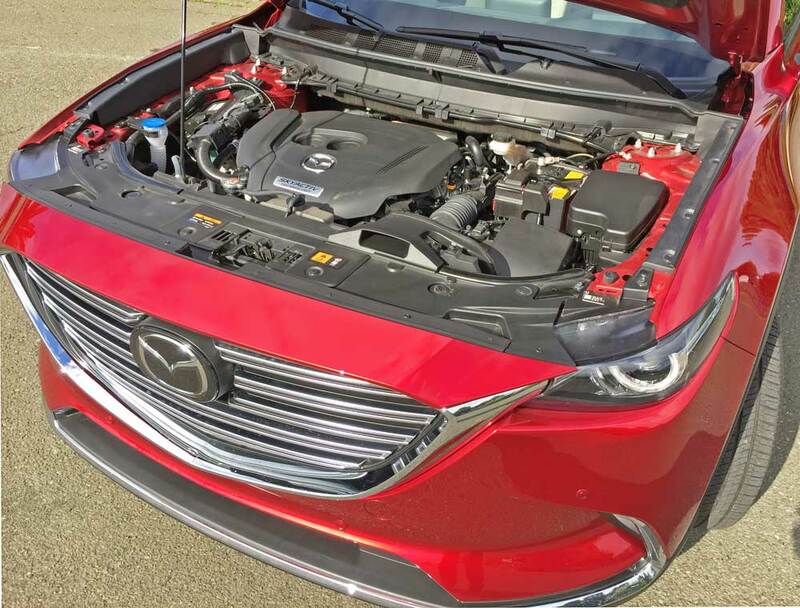 For the 2019 model year, the CX-9 has continues with its high level of performance delivered by a transversely mounted SKYACTIV-G 2.5-liter, DOHC, 24-valve V6 engine with a Dynamic pressure turbocharge system and direct coil-on-plug ignition. The horsepower rating is 250 at 5,000 rpm, with a torque rating of 310 pound feet at 2,000 rpm. Power is geared to the driving wheels via Mazda’s SKYACTIV-Drive six-speed Sport mode automatic transmission, which allows for either totally automatic or manual gear changes that may be made by the driver. Towing capacity is rated at 3,500 pounds. The design is futuristic, with the overall form displaying a sense of dynamic movement, even when at a standstill. The profile exhibits an aggressively rising belt line, topped by a boldly curved roof structure. The tapered greenhouse of the CX-9 sports blacked-out “B” and “C” pillars that are outlined by a bright surround trim, offering the visual impression of a singular cabin glass area. The front fenders are pronounced, and flank the sculpted hood, and bold trapezoidal, 5 horizontal bar grille with no top bar, but rather featuring a lower outline trim that extends into the headlight assembly suggestive of a smile, just ahead of the exaggerated, sloping nose, with a chrome trim accenting the wide lower air inlet The windshield is sharply raked as well, adding to the CX-9’s overall aerodynamic efficiency. 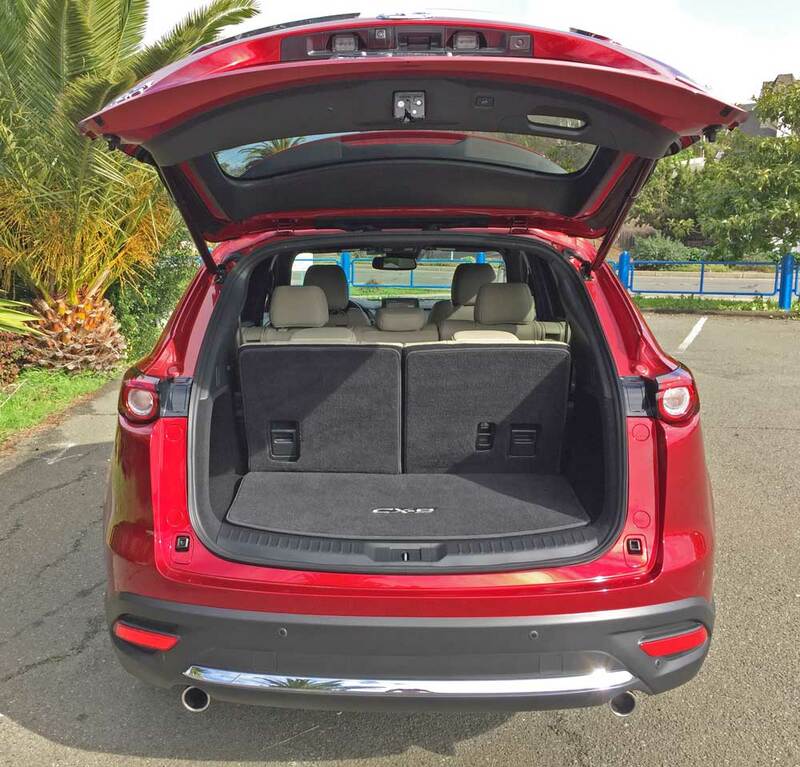 The large, bright dual exhaust outlets offer a hint of the vehicle’s performance capability. The Mazda CX-9 is offered in four trim levels: Sport, Touring, Grand Touring and Signature. All models come standard in Front-Wheel drive, or with Mazda’s predictive i-ACTIV all-wheel drive available as an option with the exception of the Signature model, where AWD is standard. Stopping power is provided by four-wheel vented disc brakes with 4-sensor, 4-channel ABS, DSC, and EBD. 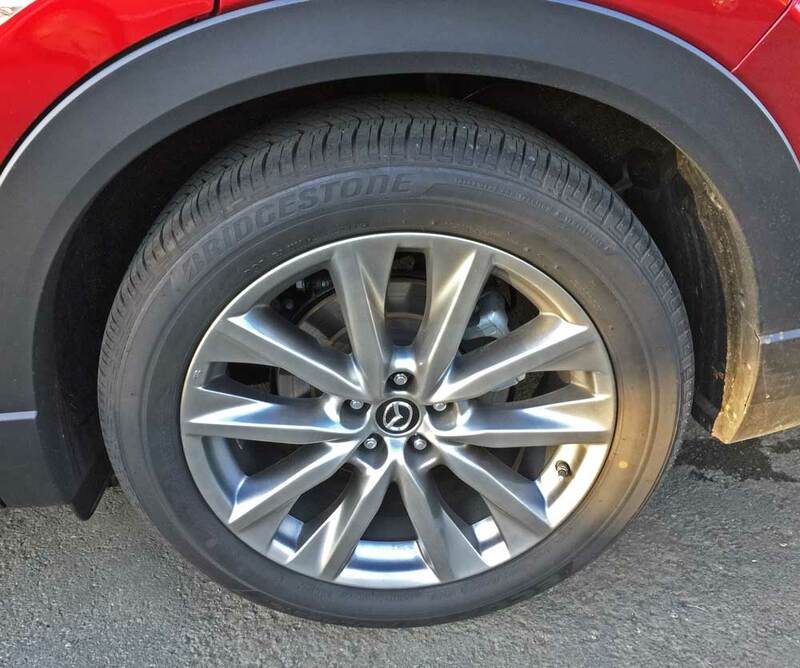 The CX-9 comes standard with 18-inch aluminum alloy wheels or with optional 20-inch alloy wheels shod with performance tires. The interior continues to serve up a sporty feel; Switchgear and controls are well thought out for optimum user friendliness, with gauges ideally placed and legible. Storage capacity is plentiful, with the center console able to stash a compact laptop. Seating is provided for seven in a multi-configurable three rows. Technology highlights include: MAZDA CONNECT™ infotainment system with a 7” or optional 8” color multi-function display with voice command, SMS text message audio delivery and replay, E911 automatic emergency notification and optional navigation system; Multi-function commander control; available windshield-projected Active Driving Display; Dynamic stability control and traction control system with standard trailer stability assist; and an Auto-dimming rearview mirror. 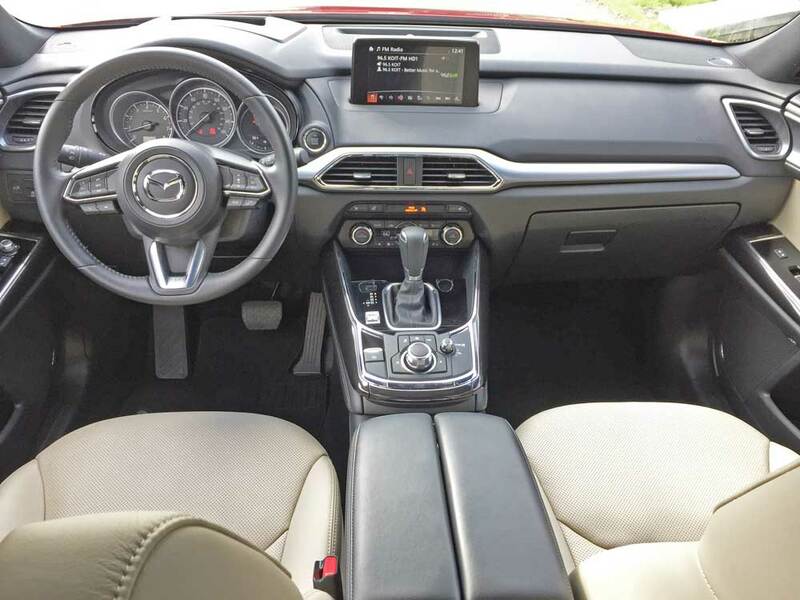 Key features served up by the CX-9 include: LED headlamps with auto off and auto height control; LED taillights; variable intermittent windshield wipers; three-zone automatic climate control air conditioning; second-row 60/40 seat with seat recline, center armrest with cup holders and optional USB inputs; third-row 50/50 split seats; heated driver/passenger door mirrors; a Power liftgate with adjustable height; available Nappa leather seats, rosewood and genuine aluminum interior materials; LED grille lighting accent (Signature); Heated front seats with three settings; Mazda Advanced Keyless Entry and Start System; and available BOSE® premium audio with 12 speakers. High Beam Control; Lane Keep Assist; Mazda Radar Cruise Control; Rear Backup Sensor, Smart City Brake Support; and Smart Brake Support. Other enhancements for 2019 include: Better sound insulation; Front parking sensors (on CX-9 Grand Touring and Signature); an easy-to-use second-row slider that provides easy third-row access; a windshield wiper de-icer (CX-9 Grand Touring and Signature); Standard Smart City Brake Support with automatic emergency braking and standard G-Vectoring Control vehicle dynamics enhancement; and available features such as: a height-adjustable power passenger seat with power lumbar support; heated second-row seats; a heated steering wheel; Traffic Sign Recognition; and full-speed Mazda Radar Cruise Control with stop and go. 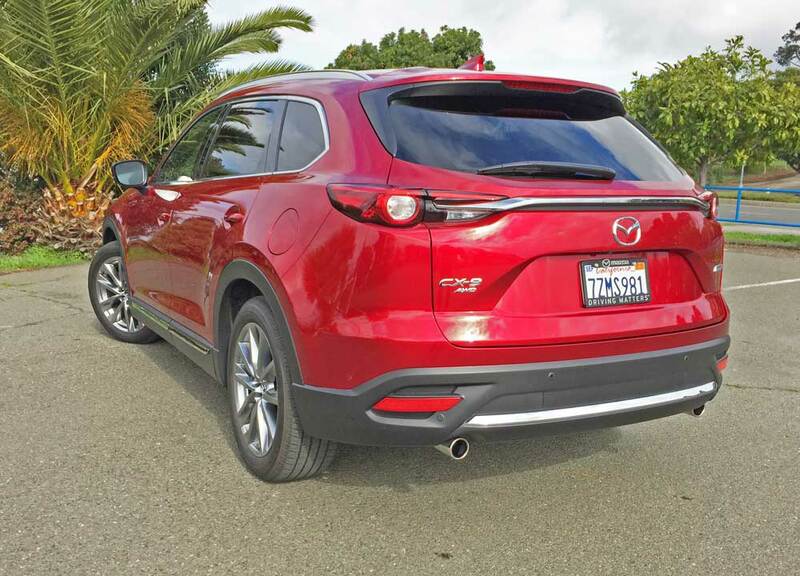 Essentially, even though the CX-7 and CX-9 are very similar in their basic appearance, the CX-9 obviously delivers more in every respect — it is longer, taller and has a higher price tag..
My test 2019 Mazda CX-9 was a Grand Touring model in an All-Wheel Drive configuration, sporting a Soul Red Crystal metallic exterior finish, with the inside executed in inside in a Sand tone, with Charcoal elements and aluminum trim accents. The base price was set at $42,640, with the price as tested totaling $43,905. after adding for the metallic exterior paint, Cargo mat and Delivery, processing and Handling fee. 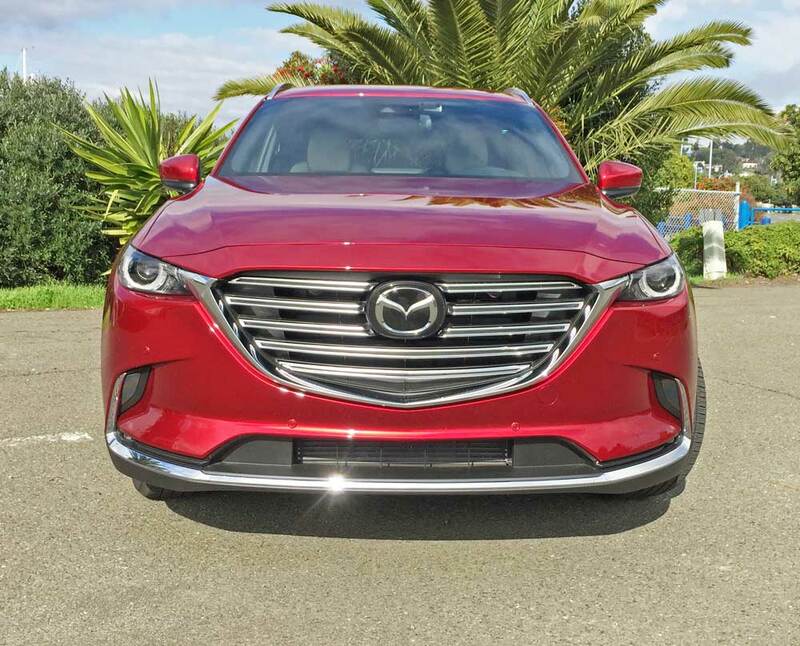 Despite its visual similarities, the Mazda CX-9 is not simply an extended, three row version of the CX-7 – it is based upon a modified architecture of Ford’s Edge, with some component elements borrowed from the Mazda6 as well. Handling attributes make for a pleasingly agile feel, reflective of its “Zoom-Zoom” sports car heritage. Even the ride quality provides a firm enough damping quality to be ranked with many sports cars. In terms of overall performance, blistering “off-the-line” smoke ’em if ya got ’em tires is not a factor. The CX-9 has a higher purpose — its intended focus is for use as a stylish, roomy and comfortable transportation pod for a family and gear to support their life’s adventures. 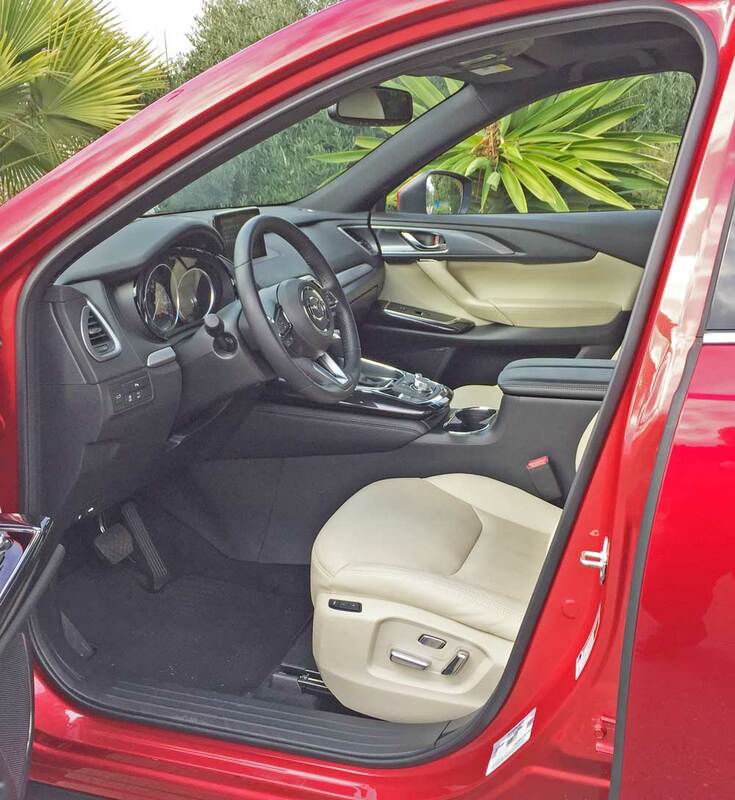 The CX-9 is capable of seating 7, but is more suited to five with its 50/50 split folding rear third row seats. 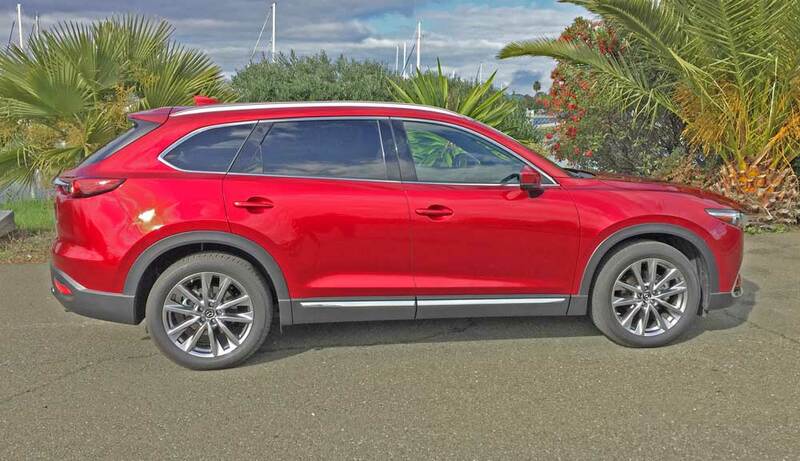 Considering its visual appeal, value and equipment content, price point, power output and serviceability for both passengers and cargo, the 2019 Mazda CX-9 Grand Touring AWD model continues to rank as one of the top contenders in competition on the Crossover SUV playing field, with several grades and equipment and feature choices offered to suit individual budgets, tastes and requirements. It represents the latest and grandest expression of KODO-Soul of Motion styling and design to date and actually meets or exceeds expectations for what a mainstream three-row crossover SUV should be. Horsepower (bhp): 227 @ 5,000 rpm – w/83 octane regular unleaded fuel / 250 hp w/ 93 octane unleaded fuel. Transmission: SKYACTIV-Drive 6-speed Sport Mode automatic with manual-shift and Sport mode. Brakes: Power-assisted four-wheel discs (vented front) with 4-wheel, 4-channel ABS with EBD and BA. Tires: Bridgestone Ecopia H/L 422 Plus P255/50 R20 104 V mounted on 5-“V”spoke silver painted alloy wheels.